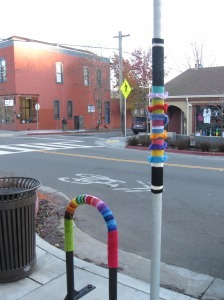 The Journal reported on Streetcolor’s installation of knitted graffiti in San Rafael, CA. 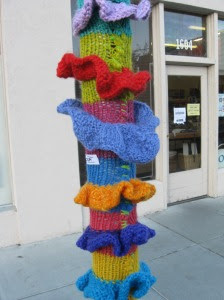 According to the article, the business adjacent to the installation had nothing to do with the yarn bomb, but employees and manager were enjoying the impromptu decoration. Said the establishment’s manager: "It's just basic knitting, but it's nice — they're really quite beautiful. It's kind of like graffiti but a gentle, soft, whimsical graffiti. It was really pretty in the sunshine." I wonder if such colorful knitted graffiti will ever expand to smaller cities and appear in our town. The concept of “Hallway praying” described in the Jan. 20, 2011, post at Momma Bug’s Blog struck a chord with me recently. Even though I have no little ones at home on a regular basis, the reminder to pray on the way to – and from -- a challenging situation is something I need to remember. Right now I am enjoying a visit to Coffee Fusion with husband Walter. Looking back from here at the end of month #1 of 2011, I wonder what in the world I have accomplished. This is a reminder to myself that I did NOT put on my list of retirement goals a consistently squeaky clean or even moderately uncluttered house. 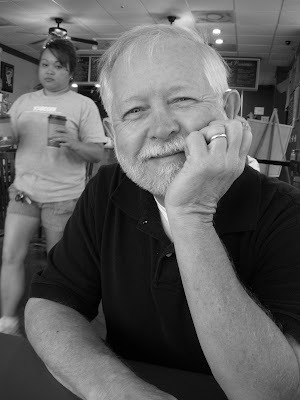 Among the items I did put on my list was to spend more time with hubby, our grands and our mothers. So there, self, you ARE meeting some of your retirement goals! I like the knitted graffitti much better than painted. beautiful. your hubby looks a lot like mine. I've got a bunch of yarn bombs here at home. I didn't know they were art. I went to the links, and these yarnbombs are beautiful!!! I'm all for it! Hmmm...wonder if you can be charged with anything, like graffiti artists are? Good thing I don't knit, or I'd be the local yarnbomber!!! I like your New Years goals! Forget the house, it's people and our loved ones who matter most!! I like the yarn bombs but wonder what they are like when it rains! I found the information on yarn bombs to be quite interesting. I don't think they've quite made it to our small Tennessee town.